As mentioned in a previous post, I embarked on a road to apply for one of the roles that Crossover @ Work advertised all over the web on sites like Linkedin and Stack Overflow. Is CrossOver too good to be true? Is Crossover similar to a freelancer organization or a service provider? Any one passed the tech trial of Crossover for work? From these you will see that it is mostly negative so I thought I have nothing to lose since I happened to be unemployed at the moment. Thank you for applying for the Program Manager – Ignite position. We look forward to helping you connect to your next Tour of Duty. As mentioned previously, the companies we represent receive thousands of applicants for every available position. Simply relying on your resume is probably not a winning formula. So to help you differentiate from the crowd and to really help us determine who is the best-of-the-best, we designed a series of ‘real-life’ assessments specifically related to this role. This will help you rise to the top and become 1 of 5 – instead of 1 of 1000. The custom assessments, however, are very challenging and require commitment on your side to really show us your skills. If you are not willing to put in the time to complete the assessments – no problem – we understand and will end your journey here. But if you are willing to differentiate yourself to see if you are the top 1% of talent globally – we’re excited to have you continue forward. We conduct a Written Evaluation where you will receive scenario questions related to this position. These questions were specifically designed by the hiring manager to evaluate how you would handle scenarios you’ll likely encounter in the job. Answer these questions to the best of your capabilities to demonstrate to the hiring manager your expertise. We will send you a separate email when we are ready for you to begin your Written Evaluation. After reading your responses and reviewing your work experience, the hiring manager will select a few candidates to interview. You will be contacted by a Crossover Account Manager to coordinate the interview. Upon successfully passing the Written Evaluation, work experience and interview(s) – you will then be contacted by a Crossover Recruiter and be offered the position. Best of luck and we look forward to learning more about you. I received the link for the written evaluation on the same day, 25 May 2016. At this point I was faily impressed with their quick response. Comments and/or questions are more than welcome. I have embarked on applying for a position as a Crossover @ Work contractor for a Program Manager position for a United States based company. Over the next couple of posts I will give an honest view of the process and how it is going. I have read and seen some very negative views about the process and rather than just take everything at face value, I have decided to experience it first hand and document my views here. Feel free to leave your views and comments below. Work — I changed jobs. I started the year off working for Fundamo/VISA and during the first half decided to make a change. I got an offer from Internet Solutions and accepted the offer and started working for them on 1 July. Must say that it was probably the best decision I made all year. I have a great team and IS is a great company to work for and I am very excited to be part of them. To see how the internet in SA operate is a real eye opener and I believe over next year or so we will see lots of change particularly around Fibre and wireless technologies like LTE and WiBand. Children — My son completed his Chemical Engineering degree at Stellenbosch University and obtained his degree on 13 December. Was a very proud moment for myself and I am so proud of my son. He is now looking for work but it is tough going so if anybody has some contact or know of something, then please contact me and let me know. My daughter is still studying for her B.Sc (Human Sciences) degree and hope to complete next year. I am so lucky to have 2 great kids that is doing very well. Personal — My son was in an accident with my car and the car was written off, my son was fine. This meant that I had to go car hunting and eventually decide on a Kia Rio 1.4 TEC Sedan and must say that I am very surprised how well it is behaving. It has all the bells and whistles as standard and after driiving it for about 8 months, I do not have any complaints. Little bit loose on the road in windy conditions but I have now got used to it with all the wind here in Cape Town. Social — On the social front nothing realy changed. Now that work has been sorted out and children are mostly done with studies, I want to spend some more time in 2013 socially and have a more balanced life. Time to meet new people and make new friends. I have to add something (and the people that know me will enjoy this) about technology. 2012 was the year I started using a Mac (MacBook Pro 13inch) and must say, I am getting used to it and it is way better than Windows I used for work. I am a Linux person and the Mac allows me to still get to the underbelly where I can tinker and where I still have some control over what I do on my machine. On the cellphone side, I upgrade to a HTC One X and am very happy with the phone itself. However I am very disappointed with the support from HTC South Africa particularly in rolling out Android Jelly Bean to their user in South Africa. I am looking forward to 2013 and make it the year where I spend more time on myself and what is important to me. I do not make new year resolutions since we break them in any case. I just want it to be a year of happiness and prosperity. Oh and hopefully will get some time to take out my golf clubs and get on the course again. This is something I realy neglected in 2012. To all my friends, family and whomever read this, I wish you all the best for 2013 and may it be a great year. As most of you might know, I am a fan of Open Source, Linux and what Google is doing so Google IO is something that I follow. Although I am not a developer anymore, I would love to attend Google IO someday and yesterday I did the second best thing by watching the full 2 hours of the day 1 keynote address live thanks to a 4MB uncapped account. There was a lot in the 2 hour keynote but I only want to touch on 3 things and how I think it might play out here in SA. this is not a review, there is enough around, just Google for it. From what I have seen, I think the Nexus 7 is an ideal media device. I would have preffered a slightly bigger screen size but the 7 inch will do. This is a real Kindle Fire killer and I think Amazon might get a bit worried. At the pricepoint of $199/$249 depending on the storage, either 8GB or 16GB, I think this tablet will do great in South Africa if the rand price is kept in the region of R2500.00. The question remain whether we will actually see this in South Africa since for the time being it is only sold out of the Google Play store and hardware sales are not available to South Africa. Here is hoping that somebody will bring the Nexus 7 to SA like is being done with the Nexus Galaxy. If and when it becomes available in SA, I will be first in line. Otherwise I will have to find a way to get one from overseas. Nexus Q is that round ball in the image to the right. This was totally new to me, one of the things that was not leaked to the world before the conference. Nexus Q is like Apple’s Airplay and steam media content to your speaker/sound system and HD TV. It either stream the content from your mobile device or from the cloud (ie Google Play). One thing that I like is that it is totally social so when your friends come to visit, they can easily add their content to the playlist, that is if they have an Android device. It seems a bit pricey at $299 and it is also only available in the Google Play Store which means it is not available in SA. Since we in South Africa cannot store our music or video collection in the Google Play cloud, I do not think this device will get much traction in South Africa. Defnitely not on my wishlist at the moment. The next version of Android called Jelly Bean aka Android 4.1 was also officially anounced. It has a lot of things under the hood like major performance enhancements but what stood out for me is the new Notification system. It shows a lot more information and lot of the actions can happen right in the Notifcation area without opening the particular app. Search also received a major update with a feature called Google Now which learn what you doing and where you are and in real time update you about information that are applicable at that point in time. It was good to see the demo about this but I would like to see this working in real life and applicable to me. Jelly Bean whill be available on the Galaxy Nexus and the Nexus 7 during July and I would assume that at the same time that manufacturers like HTC will also start working on it for their devices. I have a HTC One X which will probably be one of the first in line from HTC to get Jelly Bean but the major question remains, how soon will it be available in South Africa. Looking at the system upgrades that I have received over the last month (3 in total), I am hopefull that we will see the 4.1 upgrade for HTC One X soon after the international release in South Africa. Overall I believe that Google is making the likes of Apple, Amazon and Microsoft sit up and take notice. Yes the demo of Google Glass was amazing but I do not think that we as the man in the street will see this for maybe another 3-4 years. Google+ is slowly getting better and the new Andoid app is awesome. Lets see how many weddings gets planned via Google+ Events. I would like to hear your comments on my views and Google IO 2012 in general and if you are attending the event as a South African then let us know in the comments and what your experience are. Let’s start again after our elastious electricity company decided to switch off the power and I lost the previous incarnation of this blog post. Yesterday I spend a couple of hours searching for an APP that will take screenshots on my HTC One X without ROOTING my phone only to find out that there are 2 ways to do it build into the software that came with the phone. The one is stock standard with Ice Cream (Android 4) and the other is from HTC and is part of Sense 4. I will describe both methods and indicated what one I prefer. To use this method, press and hold the POWER/LOCK button and then press the HOME key (middle one at the bottom). Message will be displayed on the screen indicating that the screenshot was saved. The screenshot will be saved in the same directory as where your Camera shots get’s saved which I do not like. The screenshot will be save in the directory /sdcard/Pictures/Screenshots/ which I prefer since it is separate from my Camera shots. Except for the different directory, the 2 methods produces identical screenshots. Both have a size of 720×1280 and is saved in .png format. So no ROOT required, no separate APP required, just use either one of the methods above to capture your screenshots. Another reason to make the HTC One X your preferred Android phone. Let me know in the comments what you think. Now lets just hope that it is actually in the stores also. As it happens to most of us, we tend to drive to fast from time to time and pick up some traffic fines that needs to be paid. In the past there was a site www.payfines.co.za which worked just great and one could easity pay one’s files. 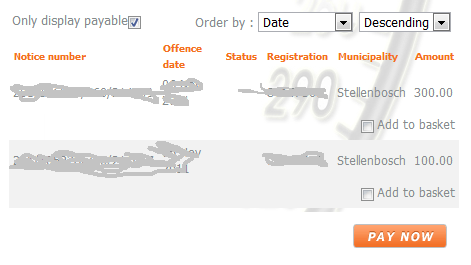 During November 2011 I got 2 fines on the same day (be carefull when you in Stellenbosch) and I tend to let it lie till the second notice before I pay the fines. Why should I give my hard earned money to somebody else if I can hang onto it. 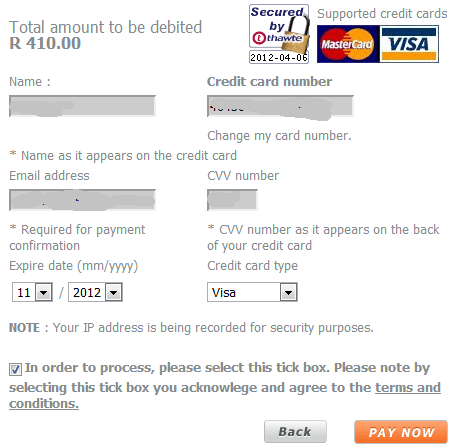 During March when I wanted to pay my fines, www.payfines,co.za did not exist anymore and was redirected to www.paycity.co.za.The first issue I had was that I had to re-register since my payfines.co.za registration did not work anymore. I did the register part and had to email some documentation to get activated which was done and a couple of days later my access was given. 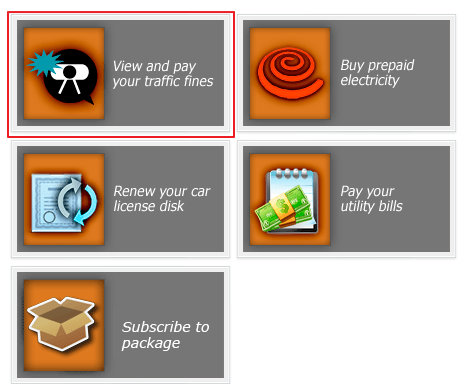 Selecting what fines to pay and clicking the PAY NOW button works as should be. One is presented with the input fields to make your payment via Credit Card as expected. Clicking OK removes the Dialog box but the site just hangs and the only way to recover is to close the site totally. 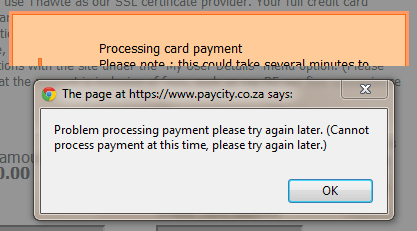 As can be seen, this was more than 3 days ago and the PayCity.co.za system is still not working. I am glad I do not depend on the system to buy electricity or some critical service since the service and quality of their site is pathetic. Payment integration services are not difficult to do and if they do not know how then I highly recommend that they get somebody that can sort their problems out. The irony is that in the latest TygerBurger (dated 4 April 2012), PayCity GM Jean-Claude Allegrucci claims how much money people can save by using their service. Mr Allergrucci, before making claims like that, please ensure that your site is working like advertised and provide a decend and acceptable service if something goes wrong. Off to go pay my fines the manual way at some counter or if you aware of another online service which will allow me to successfully pay my Stellenbosch fines, then please let me know in the commenst. My current cellphone contract has come to an end and I am due for an upgrade. 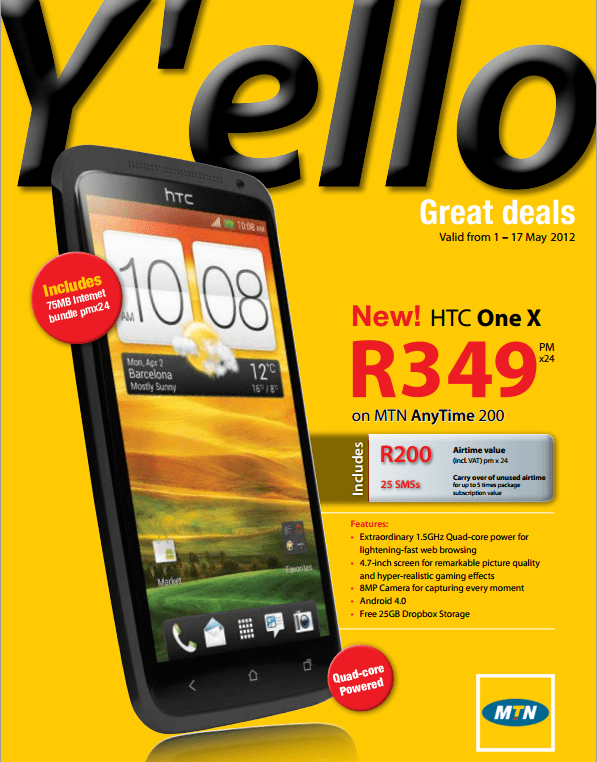 It will definitly be an Android phone and the current front runner is the HTC One X.
I am a MTN contract subscriber and have tried to find out if and when this phone will be available on contract in South Africa. So far I could not get any answer on this. If somebody have an idea then please comment below. From what I have seen in the reviews, this is a awesome device and I am praticularly impressed with the 8MP camera and video taking capabilities. Have a look at the below video. The only thing that I might miss is the absence of a SD card but with 32GB of internal storage that should be much of a issue. I mentioned that I am doing an online Python course through Udacity. The results from week one is out and I got 89% for my first homework assignment, got 1 question wrong and it was a realy stupid mistake. Currenly busy with week 2 work and must say that I am enjoying it. The work is getting more complex and we a now getting into the nuts and bolts of Python. My current 2 year cellphone contract is up for renewal this month. I have been using a HTC Desire for the last 2 years and absolutely loved it. Comparing to today’s Android phones, the Desire is very limited particularly when it comes to internal memory and storage. I have already decided to stay with an Android phone so the iPhone is not even on my list to look at. I have narrowed my search down to 2 phones namely the HTC OneX and the Samsung Galaxy SIII. On the left you see the HTC OneX which was announced by HTC at the Mobile World Conference and the specs is well known. On the right is what the Samsung SIII might look like. Samsung has not annouced the phone yet so there is not official images of it yet. From rumours and leaks, it seems to be in the same spec class as the HTC OneX. I am a HTC fan so I am leaning towards the HTC at the moment but will wait till the Samsung SIII has been announced and then take both for a test and only then decide. I just hope that my mobile provider, MTN, will be bringing both to South Africa. They have already indicated that they will be bringing the SIII but have not seen anything about the HTC OneX. From what I have read about the reviews of the HTC OneX, everybody is highly impressed with the phone particularly with the camera that is on this one. Seems like HTC has gone out of their way to make the camera experience a real good one. I use my camera phone fairly often so a good camera is a must on the phone. I am eagarly waiting for reviews on the Samsung SIII and what reviewers have to say about it. I am particurlarly looking forward to a side by side review of the 2 phones. Please comment below if you have seen or read a review like this.